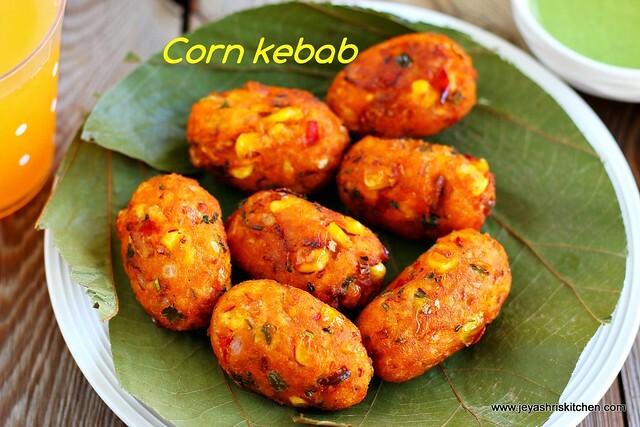 Corn kebab | corn kabab recipe i tried for the first time during the kids term break. When i called Varun's friends for a lunch at home, i made corn kebab and paneer pizza for the boys. The kebabs were vanished in no time. I have posted corn cheese balls in jeyashris kitchen but these corn kebabs are not there. I made this yesterday and clicked the pictures. I wanted to take a video of corn kebab recipe but couldn't make it. Will upload an video when i make it next time. Check out my Hara bhara kebab recipe with video. Please check the notes section to see more healthy variations. Cook the corn and take out the kernels. Alternatively you can use frozen corn too. If using frozen corn, thaw this and pat them in a kitchen towel and use it. No need to cook the frozen corn. Boil the potatoes and peel the skin. Mash with your hands and keep it aside. Chop the onions finely. Keep the capsicum ready. Chop the coriander and mint leaves. In a mixie pulse the the cooked corn kernels. In a wide bowl, add the pulsed corn kernels, mashed potatoes, chopped capsicum,onions,coriander and mint leaves. Add the rice flour, red chili powder, pav bhaji masala, chaat masala and salt. Ensure the corn mixture should be firm. If not the kebab will dissolve in oil while frying. Take a small portion of the mixture and make it into oblong shape. If you want to make it as patties shape them into round as we make for cutlets. Shape all the corn mixture into oblong shaped kebabs. Keep it refrigerated till you fry this. Heat oil and once it is hot bring it to medium heat. Deep fry the kebabs in oil till golden brown. Drain this in a kitchen towel. Serve hot with green chutney or tomato ketchup. You can skip the onions if you want and make it a no onion no garlic version. Ginger Garlic paste can be added to the kebab mixture. Since we are coarsely grinding the corn mixture, it won't splutter in oil. Instead of rice flour, you can use millet flour or besan or plain flour or cooked millets too. 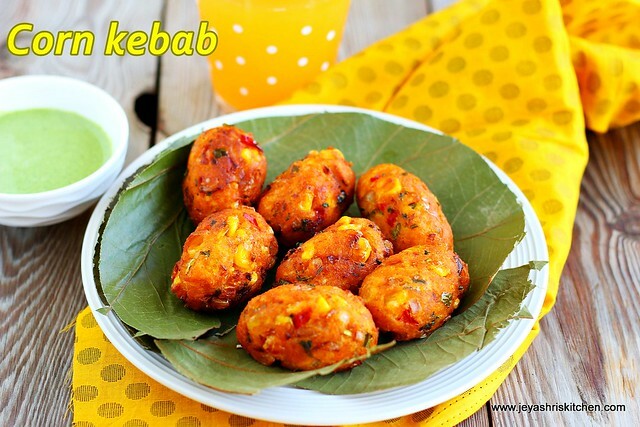 Instead of deep frying you can cook it in a tawa and make it a healthy kebab. I love the Corn Kabab recipe a lot. how well it is documented giving a crispy crust.